Convert any video with super fast processing speed. Support most portable players, including new iPad 3, iPhone 5. Highly Compatible with Mac OS X Mountain Lion. Vdeo cropping, movie trimming, and video effect adjustment. 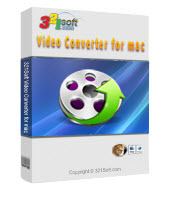 Mac Video Converter is an ideal Mac video file converter software to both novices and professionals, with its straightforward interface design and powerful conversion engine. Mac Video Converter helps convert MKV/MP4/AVI/MOD/TOD on Mac as well as other popular formats like MPEG, VOB, WMV, H.264/AVC, RM, MOV, XviD, 3GP, TS, MTS, M2TS, SMV, AMV, F4V, M4V, MXF, SWF, FLV, DV, etc. It is also an audio converter for Mac that can extract audio from video and transform between M4A, MP3, WMA, RA, M4A, AAC, AC3 audios as you want. 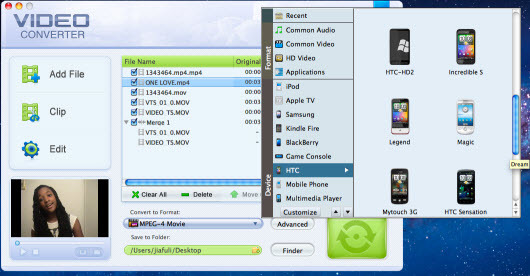 Just several clicks with this Mac video converter software, you will freely enjoy your high-quality video clips on Mac and all portable media player such as iPad 3, iPod touch, iPhone 5, iPhone 3G, Apple TV 3, PSP, PS3, Xbox 360, Wii, Smart Phone like BlackBerry, MP3/MP4 players like Archos, Creative Zen, iRiver, Pocket PC, PDA, etc. Mac Video Converter also provides video editing functions like video cropping, movie trimming, and video effect adjustment (including resolution, bit rate, frame rate, brightness, saturation, and sound channel, etc.). Video conversion on Mac Mountain Lion can never be so easy! Video Converter for Mountain Lion, supports the latest Mac OS X 10.8. MP4 Converter - Easy-to-use, fastest video to mp4 convertion software in the world. AVI MPEG WMV Converter - convert AVI, MPEG, WMV from one format to another.